Access to drinking water and sanitation which are available, accessible, affordable, acceptable and safe are human rights. The rights to safe drinking water and sanitation for all are enshrined in the Constitution, laws and regulations of the Republic of Armenia. Armenia, while not yet being a Party to the UNECE1-WHO/Europe2 Protocol on Water and Health, has been actively involved in the work carried out under its framework. In particular, Armenia carried out a self-assessment of the situation of equitable access to water and sanitation in 2015-2016 by applying the Equitable Access Score-card, an analytic tool developed under the framework of the Protocol on Water and Health. 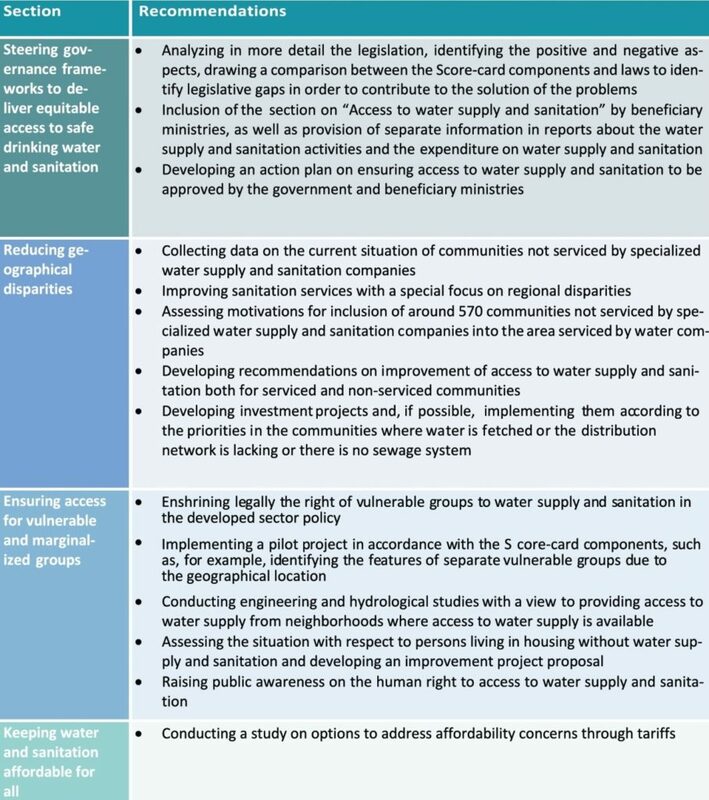 Such assessment highlighted a number of challenges to ensuring equitable access to water and sanitation, in particular an incomplete strategic framework for achieving equitable access to water and sanitation, geographical disparities in access to water and sanitation services, obstacles faced by vulnerable and marginalized groups to access and affordability concerns. In July 2016, Armenia announced its intention to develop an action plan to ensure equitable access to water and sanitation to be approved by the government and beneficiary ministries. The aim of the Action Plan 2018-2020 on the Provision of Equitable Access to Water Supply and Sanitation in the Republic of Armenia is to establish a list of measures/activities directed at ensuring the provision of equitable access to water and sanitation, as well as to establish the evaluation criteria, responsible authorities, partners and the sources of funding for the implementation of the proposed actions. The logic of the Action Plan stems from the legislative, program activities and measures implemented in recent years towards ensuring equitable access to water and sanitation, as well as from the assessment of these measures and lessons learned. The expected impacts from the Action Plan implementation are as follows: – Improvement of equitable access to water and sanitation management (financing and legal regulations); – Reduction of geographic disparities in ensuring equitable access to water and sanitation; – Provision of equitable access to water and sanitation for marginalized and vulnerable groups. The development of the 2018-2020 Equitable Access Action Plan builds on the findings of the previous self-assessment of the situation of equitable access to water and sanitation in Armenia. The logic of the Action Plan stems from the legislative, program activities and measures implemented in recent years toward ensuring equitable access to water and sanitation, as well as from the assessments of these measures and lessons learned. The aim of developing an Action Plan was to establish a list of measures/activities directed at providing equitable access to water and sanitation, as well as the evaluation criteria, responsible authorities, partners and the sources of funding. The development of the Action Plan in 2016-2017 was driven by the State Committee on Water Systems of the Ministry of Energy Infrastructures and Natural Resources and the NGO “Armenian Women for Health and Healthy Environment”, with support from UNECE. The Action Plan was drafted by a group of national experts. The draft Action Plan was presented and discussed during the 16th meeting of the Steering Committee of the National Policy Dialogue in the Water Sector of Armenia (Yerevan, 7 April 2017). The Action Plan was then thoroughly discussed at the National Public Consultation Meeting on Equitable Access Action Plan convened by the Armenian Women for Health and Healthy Environment (AWHHE) NGO in Yerevan, May 12th Recommendations made by the participants of the meeting to improve the plan were given proper consideration. The project entitled “Development of an Equitable Access Action Plan in Armenia” was implemented by the NGO “Armenian Women for Health and Healthy Environment” within the framework of the United Nations Development Account Project “Strengthening Governments’ and water operators’ capacity to ensure equity of access to water and sanitation in countries with economies in transition in the Economic Commission for Europe region”. Lead agency(ies): State Committee of Water Economy of the RA Ministry of Energy Infrastructures and Natural Resources and Armenian Women for Health and Healthy Environment NGO (AWHHE). Contributing agencies and stakeholders: RA Ministry of Health, RA Ministry of Labor and Social Affairs, RA Ministry of Education and Science, RA Ministry of Territorial Administration and Development, State Committee on Urban Development under the RA Government; Private sector, NGOs, Independent Experts. Scale of the Action Plan: National and Regional. provision of equitable access to water and sanitation for marginalized and vulnerable groups. Analysis of the water legislative framework and identification of legislative barriers to ensure the implementation of the Equitable Access Score-Card. Development of a draft concept defining the responsibilities for the provision of equitable access to water and sanitation. Organization of a Roundtable Discussion to provide for the requirements of the Concept Note of equitable access to water and sanitation. Multi-disciplinary assessment on the concept on equitable access to water and sanitation by different stakeholders. Inclusion of the “Access to Water Supply and Sanitation” Section (the water supply and sanitation activities and the finances spent on water supply and sanitation) in the annual reports of responsible authorities. Assessment of the financial and logistical resources necessary for ensuring the implementation of the concept on equitable access to water and sanitation. Compilation and analysis of information about the current situation in the communities not serviced by a specialized water and sanitation company, creation of a database. Development of a plan and timetable of activities to reduce geographical disparities in equitable access to water and sanitation based on paragraph 6.4. of the UN Sustainable Development Goals. Inclusion of the communities not serviced by a water company in the development and investment programs of the water company. RA Ministry of Labor and Social Affairs; RA Ministry of Health; RA Ministry of Territorial Administration and Development; RA Ministry of Economic Development and Investment; RA Ministry of Finance; RA Ministry of Labor and Social Affairs , RA Ministry of Justice; RA Ministry of Education and Science; State Committee on Urban Development under the RA Government; Private sector, Water Company “Veolia Djur” CJSC ; NGOs. The public consultation meeting was convened on the 12th of May 2017, which was aimed at the presentation of draft Action Plan 2018-2020 for discussion and improvement before presenting it to the Government of Armenia for approval. Final approval came on August 4, 2017 with the Order N 130A of the Head of State Committee on Water Economy. The drafting and adoption of the Action Plan would not be possible without the National Expert Group, Armenian Women for Health and Healthy Environment NGO and international consultants: Chantal Demilecamps (UNECE, Secretariat of the Protocol on Water and Health) and Roberto Martin-Hurtado (UNECE expert).